HE WAS once dubbed Australia's fattest man. Andre Nasr was obese, sick and eating himself to death. At his heaviest, Mr Nasr topped the scales at 468kg and once broke his couch because of his weight. 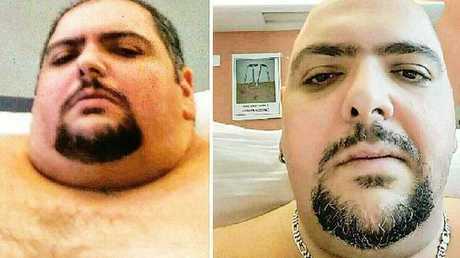 Now weighing in at 370kg, Mr Nasr is making a last-ditch effort to save himself from his bulge, by undergoing a high-risk surgery that could potentially kill him. Andre with his family ahead of his high-risk sleeve gastrectomy surgery. 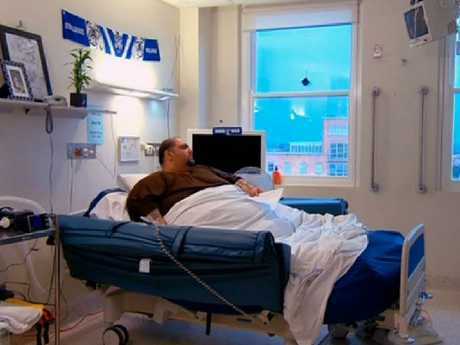 Mr Nasr, who appears on The Project on Tuesday, is the heaviest patient to ever undergo the dramatic weight loss surgery. 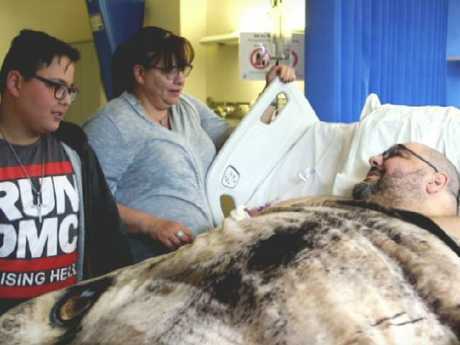 Almost immobile, he hopes the weight loss will bring him down to 118kg - a staggering 350kg lighter than his top weight. 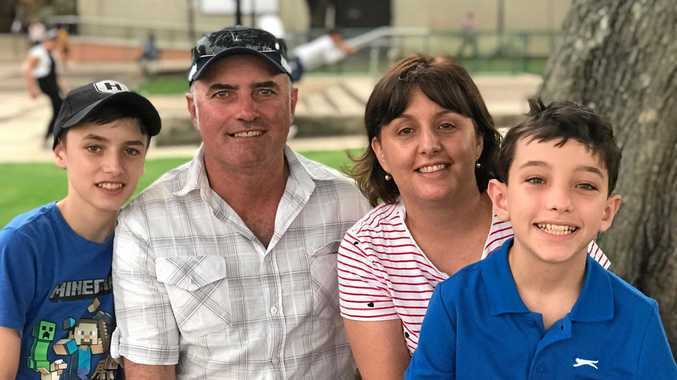 Mr Nasr's surgery, a sleeve gastrectomy to be performed by Dr Craig Taylor at Concord Hospital in Sydney, involves cutting away 70-80 per cent of the stomach and leaving behind a narrow tube or sleeve. Andre originally weighed 468kg, but is now 370kg. The purpose of the operation will not only limit his capacity to eat but also his desire for food. For as long as he can remember Mr Nasr has been obsessed by food. "If someone was getting married the first thing we would talk about is what food they are going to serve," he said while lying in the hospital bed. "If someone died, what food are we going to have at the wake?" Andre Nasr was once Australia’s fattest man. Speaking to guest reporter Dr John D'Arcy, Dr Taylor said there is a chance Mr Nasr could die from the procedure, with a one in 10 chance of not pulling through. "But he could die from his obesity," he said. "I told the surgeon I'd be happy with 50/50 [survival rate]," Mr Nasr said. Mr Nasr's wife, Natasha, who has tried to change his eating habits for years, said food for her husband is like a drug. According to the Dr Craig Taylor at Concord Hospital, there is a one in 10 chance Andre Nasr won’t survive the surgery. "Just like heroin is for other people, or alcohol for an alcoholic," she said. "I would say no, but then he would ring his family and they would bring him food through the window," she said. "Barbecue chicken, large chips, drinks." Nastasha with her husband Andre, who was once Australia’s fattest man. Appearing on Channel 7's Sunday Night program in 2015 Mr Nasr said he couldn't get out of bed and had to be lifted out of his house when he fell ill and needed to be hospitalised. Previously Mr Nasr did manage to lose 199kg in a year by dramatically decreasing his calorie intake which had previously been about 12,000 calories a day. At his lowest point, Nasr, who spent 14 months in hospital with a life-threatening infection, said he had been "killing myself" with food. His full story will appear onThe Project, 6.30pm tonight on Ten.